Have you been told you need a Miller Trust? A Miller Trust is a Medical Assistance Income Trust. What does this mean and why might you need one? Many people need to go into nursing home care but have too much income to qualify for Medicaid yet not enough to pay for the full amount of their care. Currently, in Iowa, if you have more income than $2199 per month but less that $5833, you may qualify for a Miller Trust. This is an irrevocable trust. Your income is deposited and then paid to the care facility after some expenses are disbursed. The only money in the trust will be income like social security and pensions, not savings or other liquid assets. The care facility will then be paid from the trust and medicaid will pay the balance of the monthly charges. A Miller Trust can be set up even if one spouse lives outside the nursing home and there is more than $2000 in assets. There is a catch - upon death anything left in the Trust will be recovered by the state up to the amount medicaid paid for the beneficiary's care. One thing to remember - a trust that is set up incorrectly can make a person ineligible for medicaid assistance. It is important to have legal counsel when setting up your Miller Trust. 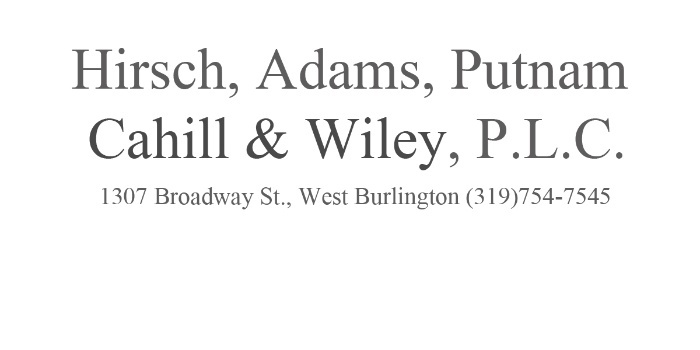 Both Mr. Cahill and Mr. Wiley are well versed in the ins and outs of Miller Trusts. Call today 319-754-7545 to arrange a time to talk to one of them to see if a Miller Trust would be beneficial to you.